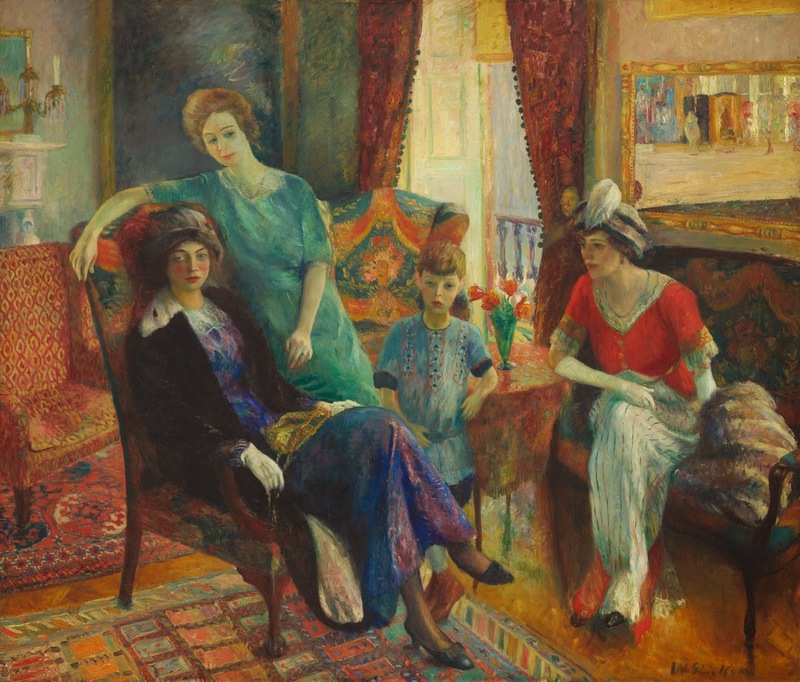 Dr. Wattenmaker, throughout his career, has carefully and elaborately illustrated exactly what Glackens borrowed from Renoir and how Glackens made it his own. Dr. Barnes and Violette de Mazia did as well. However, as far as I know, no one compared the two pictures Dr. Wattenmaker cited, so I decided I would. Dr. Barnes declared the picture a “typical conventional group-portrait, plastically weak, and only mildly pleasing as a decorative illustration.” Do you agree? The three figures establish a central pyramidal unit balancing a diagonal sequence of volumes extending across the canvas from the still-life grouping now on the lower left to the dog now on the upper right. That pyramidal grouping slopes inward on both sides. 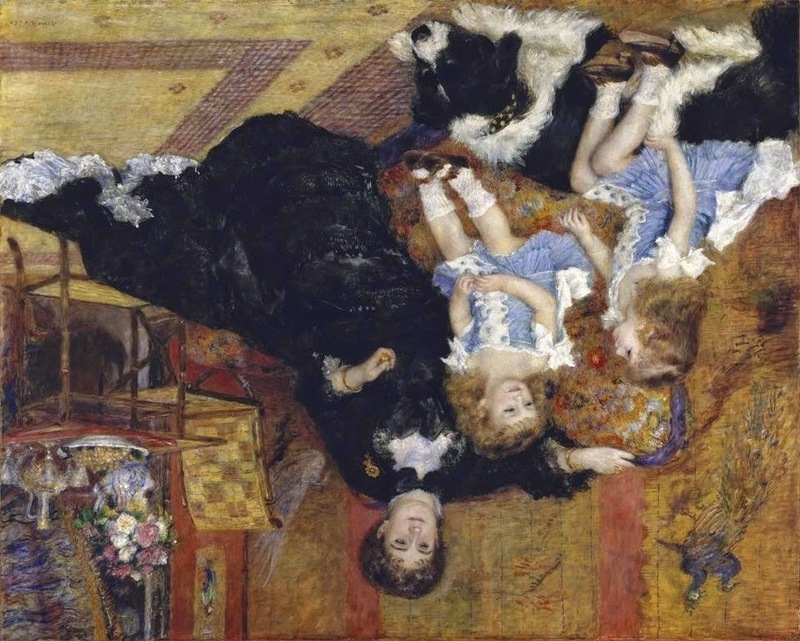 The black/white contrasts of the woman’s dress, dog’s fur, and the children’s socks and shoes rhythmically repeat the ripples of white trim on the girl’s and woman’s dresses as well as the dog’s fur. These squiggly decorative units contrast with the vertical bands in the screen and the geometric pattern in the floor. Shadows are slightly bluish-gray, the flesh shiny-smooth, and while the volume is fully three-dimensional, it is slight and without internal luminosity. 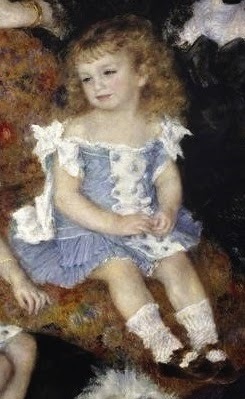 The curls in the hair echo the curls of the dress’s center and contrast with the more crinkly decorative whites of all the dresses. Similarly, short stripes ripple the socks, enliven the sofa’s pattern, and flute the folds in the figure’s dress’s and hair as well as the dog’s fur, but Dr. Barnes argues this “sort of painting represents the bad influence of Delacroix in color and of Monet in technique.” I translate this to mean the pattern is “on” the surface rather than integrated into the color volumes, more a “showing off” of brushwork rather than a unified expressive statement. Glackens’ picture measures 71 15/16 x 84 inches; Renoir’s 60 ½ by 74 ¾. When the Met acquired Renoir’s painting in 1907, it was the most recent work in the museum’s collection and received extensive publicity, so it could have influenced the scale of Glackens’ painting as well as its composition. Monkey or not, the four figures in this picture, whether seated, standing, or leaning, bend, turn, and rise upwards with the graceful, delicate elegance of a luminous praying mantis. 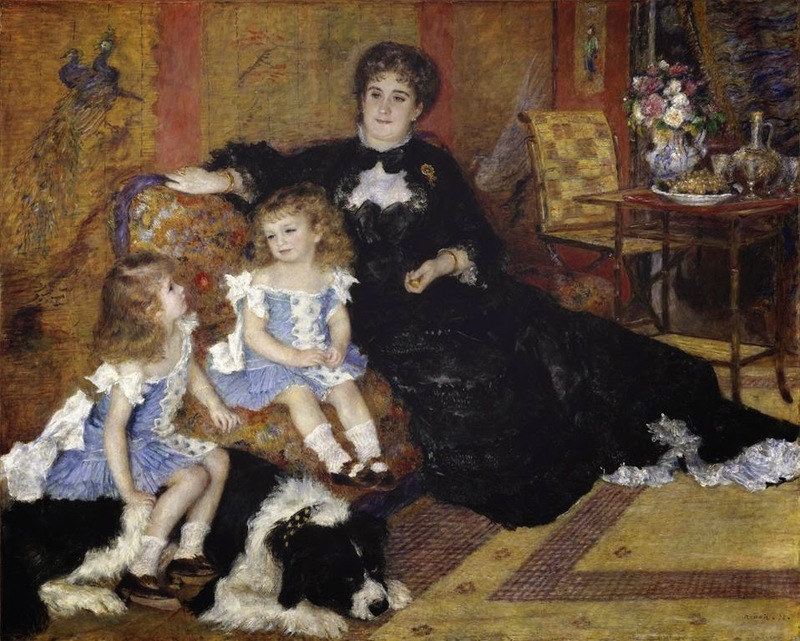 The figure now on the left, unlike Renoir’s Madame Charpentier, bends inward, not outward. The chair back, now on the right, arcs inward more dramatically than the girl in Renoir’s painting. Three-dimensionality in the Glackens is slighter, the volumes lighter, and that puts the emphasis on color areas functioning as units of decorative pattern. Unlike the fluid, compositional poise in the Renoir, where one color unit flows into another, in Glackens the beat is light, gentle, and quick, more like a staccato tapping than a legato flow, similar to the rat-a-tat-tat made by the red belly woodpecker on the tree outside my bedroom window that wakes me up in the morning. Notice the patterned areas of floor and tiles. Examine the space under the chair legs, and around and between the feet—especially the four feet shown in the middle. Check the series of color units and spatial relationships to the right. A fan-shaped repoussoir constructed from two color units of the dress (the bright red and the striped cerulean/blue and white apron) push back the pocket of space under the chair leg. This orchestration of patterned areas, gentle movement, and vivid color in intricate spatial relationships sets the motif of the entire painting. In the Glackens’, orange/yellow/red color units recede to the triangular pulled-back curtains. Each color unit: (from the ultramarine/alizarin dress covering the crossed legs which echo the triangular opening in the background; to the standing boy wearing a cerulean tunic while leaning on a hot orange table top and backed by the orange/cerulean blue pattern of the chair) carries the eye, like a series of tightly orchestrated repoussoir units, to a glowing orange-yellow-cerulean-ultramarine open space beyond the curtains. In the Renoir, the spatial recession moves from the foreground slant of the black dress to the rich, warmth of luminous gold, red, tans and deep blues, in an equally geometric series of “steps and risers” (look at the golden horizontal base of the table, the seat of the chair, the shelf and the table top) to the dark space created by the pulled-back tapestry. 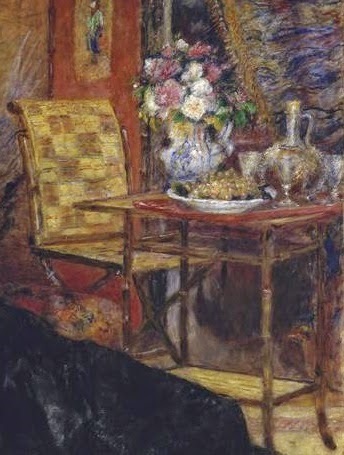 However, in the Renoir, each color unit also stresses its illustrative identity: the vase holding the flowers has a silky smooth surface gleaming with ceramic hardness; the decanter bubbles with metallic golden highlights; the wicker chair’s roughness contrasts with the curtain’s heavy wooliness. Perhaps the most striking and obvious difference defining each artist’s interest occurs in the vase of flowers. In the Glackens’, the sharp, cool green of the cone-shaped and flattened vase contrasts with the vivid, red/orange of the flattened, fluted cone-shaped flowers. In the Renoir, the silky-smooth, blue-patterned fully rounded vase holds a series of pink, white, lavender, and green three-dimensional, puffy, soft, shimmering color units. So far, we have merely compared and contrasted two paintings. 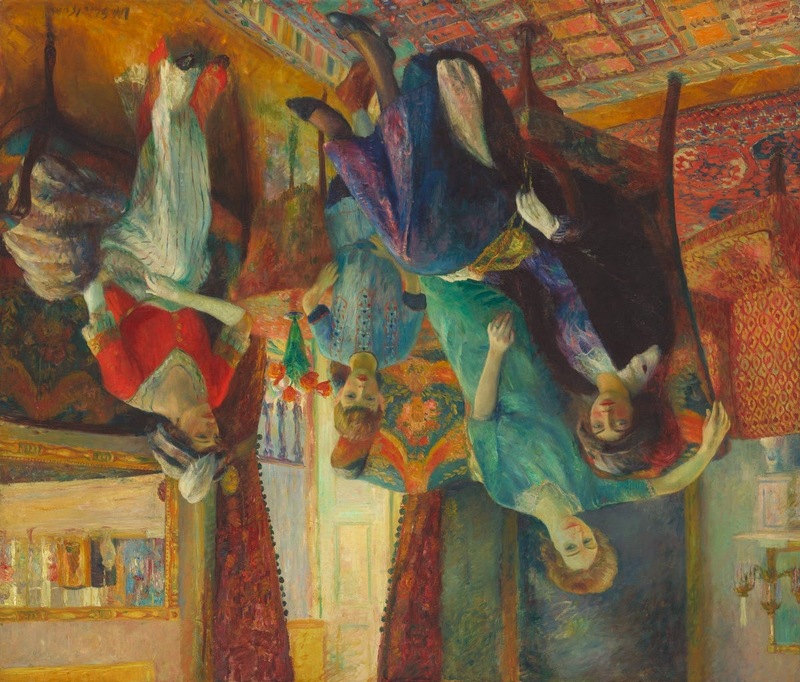 In the next post, I will compare Glackens’ and Renoir’s drawings and concentrate on line and space to show how Glackens perfected his ability to express what interested him: active movement, colorful light, vivid color, and sparkle. In so doing, I will further define and evaluate the visual ideas Glackens’ adapted from Renoir as well as other artists.